European version “Pickled Punks” released by low.b Records. Tracks 1-5 written by Theophobos von Goreblast, track 6 by Balthasar Bidembach (L)/ german traditional (M). Tracks 1-6 decomposed by SxRxOxM, recomposed by Theophobos von Goreblast. Recorded by SxRxOxM Jan. & Dec. 2012 at “Die Lobby” of the Lobby Union, Alberestadt im Friesenfeld. Mixed and mastered by Jarek Wysocki, Soundscope Engineering, PL. Tracks 7,8,9,11 written by Pulmonary Fibrosis, track 10 written by Autopsy. Artwork and layout by Theophobos von Goreblast. 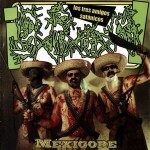 Mexican version “Méxigore & Intestinal Regurgitations” released by American Line Productions. Limited to 500 copies! Tracks 1-5 written by Theophobos von Goreblast, track 6 by Oxidised Razor. SxRxOxM Artwork and layout by Theophobos von Goreblast.